The Chrysler Group has announced the details for the 2014 Dodge Challenger and while there are no major changes for the new model year – the overall performance of the Challenger lineup is improved with a new Launch Control system for the SRT models along with new optional handling packages for those cars with the Pentastar V6. First of all, the 2014 Dodge Challenger powered by the 3.6L Pentastar V6 gets two new packages that add performance without adding power. First up is the Super Sport Group which adds chrome 20 inch wheels wrapped in wide P245/4520 performance tires, a 3.07 rear end gear for better acceleration, metal steering wheel mounted paddles shifters, a special Sport shifting mode, a sport suspension setup and performance brakes. Those who want a darker look with the features of the Super Sport package can opt for the Sinister Sport Group. The Sinister Sport package includes all of the working bits of the Super Sport Group including the suspension, the brakes, the Sport shift mode, the paddle shifters and the 3.07 rear end gear but instead of the chrome 20 inch wheels, the Sinister Sport Group wears high gloss black 20 inch wheels. Challenger SXT Plus buyers can also add HID projection headlamps. The 2014 Challenger SXT, SXT Plus and Rallye Redline all come with the 3.6L Pentastar V6 with 305 horsepower and 268lb0-ft of torque. The biggest change for the 2014 Dodge Challenger with the 5.7L Hemi is the new R/T Blacktop package that adds the components of the Super Track Pak (245/45/20 performance tires, 4-wheel heavy duty brakes, performance steering and sport suspension) with a fully blacked out appearance package. The 2014 Challenger R/T Classic now has seats featuring suede centers and Nappa leather bolsters. Challenger R/T buyers can also opt for the R/T Redline package which includes a dual color red and dark grey stripe that run the length of the body side and 20 inch black chrome wheels with a red stripe around the bead and a red inner “backbone”. The 2014 Dodge Challenger R/T, R/T Plus and R/T Classic models are powered by the 5.7L Hemi V8 with the buyer’s choice of a 5-speed automatic or a 6-speed manual transmission. Those models with the manual transmission offer 375 horsepower and 410lb-ft of torque while the Hemi Challenger R/Ts with the automatic transmission pack 372 horsepower and 400lb-ft of torque. The Challenger R/T and R/T plus come with a 3.06 rear axle while the R/T Classic comes with a 3.92 rear axle for improved acceleration. Finally, the 2014 Dodge Challenger SRT 392 remains pretty much the same but the company has added a new launch control feature that should make the 470 horsepower beast much easier to get off of the line with as much urgency as possible. All 2014 Challenger SRT models come with the 6.4L, 392 cubic inch Hemi that sends 470 horsepower and 470lb-ft of torque whether it is mated to the 5-speed automatic or 6-speed manual transmission. 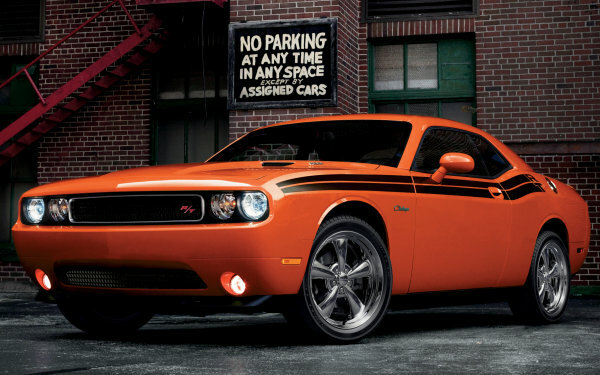 At launch, the 2014 Dodge Challenger will be available in six exterior colors - Header Orange, Redline Tri-coat, Plum Crazy, TorRed, Ivory Tri-coat and Phantom Black Tri-coat Pearl.